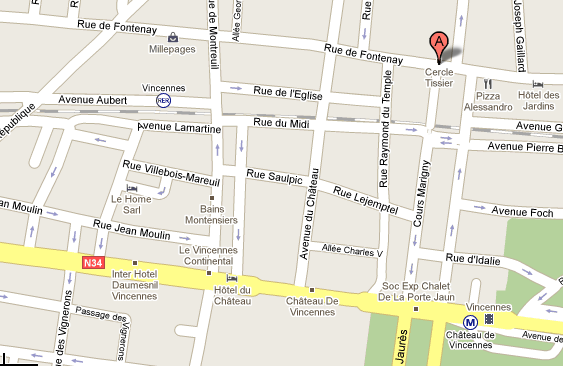 Address: 108 rue de Fontenay in the city of Vincennes. RER station and Metro stations are only 5 minutes from the dôjô. If you come by car there is a car park in the area (5 minutes from the dôjô on the same side of the street). The Cercle Tissier is located behind the building on the street. Look for the restaurant “Lou Cantalou”, on the right is the entrance of a building, enter and go through the building. You are outside in a court with flowers and trees, the dôjô is in front of you. I am here in Paris but it is impossible to find our the times of training this week from the websites. Can you send me a text with the detail? I don’t want to miss out. It’s currently Friday 10th at 6pm. Merci Gillian from Australia.